This article is about the TV series. For the comic books, see Avatar: The Last Airbender (comics). For the 2010 film, see The Last Airbender. Avatar: The Last Airbender (Avatar: The Legend of Aang in some regions) is an American animated television series that aired for three seasons on Nickelodeon. The series began airing in February 2005 and concluded in July 2008. Avatar: The Last Airbender is set in an Asiatic-like world in which some people can manipulate the classical elements with psychokinetic variants of the Chinese martial arts known as "bending". The series is presented in a style that combines anime with American cartoons and relies on the imagery of East/South Asian, Inuit, and New World societies. It follows the protagonists, 12-year-old Aang and his friends, who must bring peace and unity to the world by ending the Fire Lord's war with the rest of the world. The series was commercially successful and was acclaimed by audiences and critics, who praised its art direction, humor, cultural references, characters, and themes. It was nominated for—and won—Annie Awards, Genesis Awards, a Primetime Emmy Award, and a Peabody Award. The first season's success prompted Nickelodeon to order a second and third season. Merchandising for the series consisted of action figures, a trading card game, three video games, stuffed animals distributed by Paramount Parks, and two Lego sets. An art book was published in June 2010. The complete series was released on Blu-ray on June 5, 2018 for the 10th anniversary of season 3's finale. The series inspired a critically panned but financially successful live-action film, The Last Airbender, directed by M. Night Shyamalan and considered one of the worst movies ever made. An animated sequel series, The Legend of Korra, aired from 2012 to 2014. A new live-action remake of the series by its original creators to be produced for Netflix was announced in September 2018. Avatar: The Last Airbender is set in a world—adjacent to a parallel spirit world—that is home to humans and hybrid animals. 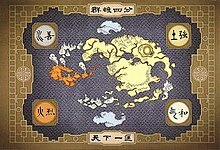 Human civilization is divided into four nations, named after the four classical elements: the Water Tribes, the Earth Kingdom, the Fire Nation, and the Air Nomads. Each nation has a distinct society in which select people, known as "benders" (waterbenders, earthbenders, firebenders and airbenders), have the ability to telekinetically manipulate and control their nation's element using martial arts. The Avatar is the only person with the ability to bend all four elements. The Avatar, who may be male or female, is an international arbiter whose duty is to maintain harmony among the four nations, and act as a mediator between humans and spirits. When the Avatar dies, their spirit is reincarnated into the next Avatar, who will be from the next nation in a set order that is known as the Avatar cycle: Fire Nation, Air Nomads, Water Tribe, and Earth Kingdom. An Avatar is required to master each bending art, beginning with the element of their home nation, and proceeding to learn the others in the order of the Avatar cycle, starting at the age of 16. Avatars also possess the ability to enter a condition known as the Avatar State, in which they gain the knowledge and abilities of all past Avatars. Although it is when they are most powerful, if an Avatar were ever to be killed while in the Avatar State, the reincarnation cycle would end and the avatar would never again be reborn. More than a century before the events of the series begin, Fire Lord Sozin, ruler of the Fire Nation, planned a world war to expand his nation's territory and influence. He was prevented from carrying out his plans by Avatar Roku, who was born in the Fire Nation. After Roku's death, the Avatar was reincarnated as an airbender named Aang. Because the Avatar was now a child, Sozin saw his chance and proceeded with his militant plans. At the age of twelve, Aang learned about his avatar status because of the threat of Sozin's war. Afraid of his new responsibilities and of separation from his mentor Gyatso, he fled his home on his flying bison, Appa. Aang was forced into the ocean by a storm; he entered the Avatar State and encased himself and Appa in suspended animation in an iceberg near the South Pole for one-hundred years. Sozin, knowing the avatar's reincarnation cycle mandated an Air Nomad was the new Avatar, carried out a genocide against the Air Nomads during the passage of a once-a-century comet that increased the firebenders' power, and continued his world conquest. In the present day, as the Fire Nation continues its war against the other nations, Katara, a fourteen-year-old waterbender of the Southern Water Tribe, and her older brother, Sokka, find and revive Aang and Appa. Aang learns about the war, and the siblings join him to reach the Northern Water Tribe at the North Pole so he and Katara can learn waterbending. Aang's return attracts the attention of Prince Zuko, the exiled son of the current Fire Lord Ozai, who pursues them, accompanied by his uncle Iroh. Aang is also pursued by Zhao, a Fire Nation admiral who intends to win Ozai's favor and rob Zuko of his redemption. En route to the North Pole, Aang learns about the genocide against his people when he visits the ruins of the Southern Air Temple. During the winter solstice, Aang meets the spirit of his predecessor, Avatar Roku, and comes to terms with his responsibilities. With the Northern Water Tribe, Aang and Katara learn advanced waterbending from Master Pakku; Sokka falls in love with the chief's daughter, Princess Yue. Zhao's navy lays siege to the tribe, seizing the mortal forms of the ocean and moon spirits—the source of waterbending—and causing a lunar eclipse. Zhao kills the moon spirit to deprive the waterbenders of their abilities but Aang joins with the ocean spirit to drive off the enemy fleet while Yue sacrifices her life to revive the moon spirit. When Ozai hears about his older brother Iroh's resistance to Zhao, he sends his daughter Azula to capture Iroh and Zuko. After leaving the Northern Water Tribe, Katara continues teaching Aang waterbending while the group searches for an earthbending teacher. They meet Toph Beifong, a twelve-year-old, blind earthbending prodigy who wants independence from her upper-class family. Pursued by Princess Azula, Zuko and Iroh lead new lives in the Earth Kingdom as wanderers and refugees, settling in the capital city Ba Sing Se. At a library guarded by the spirit Wan Shi Tong, Aang and his group learn an imminent solar eclipse could let them stop the Fire Nation before Sozin's Comet arrives. They journey to Ba Sing Se to inform the Earth King of this information. In the city, they find that the Earth King Kuei is a puppet ruler, manipulated by Long Feng, leader of the Dai Li secret police. After Aang's group exposes Long Feng's political machinations, Toph is captured but escapes by learning to bend metal. The Dai Li join Azula to instigate a coup d'état of Ba Sing Se, and Zuko, who has spent his time in Ba Sing Se trying to come to terms with his identity, sides with his sister Azula. During a face off in the catacombs underneath the ancient city, Azula nearly kills Aang, forcing the protagonists to retreat with help from Iroh and leaving the Earth Kingdom under the control of the Fire Nation. Aang emerges from a coma to find his friends and allies disguised as soldiers on a Fire Nation ship, preparing to invade the Fire Nation capital during the solar eclipse. The invasion is at first successful but Aang and his friends cannot find Ozai and are forced to retreat. Zuko learns about his father's intention to destroy the Earth Kingdom during the return of Sozin's Comet; he begins to regret his decision, and abandons the Fire Nation to join Aang and teach him firebending. As the comet approaches, Aang, a pacifist, wrestles with the possibility that he will have to kill Ozai to end the war. As he, in seclusion, consults the spirits of his predecessors for advice, Katara and the others encounter Iroh, who is leading a secret society called the Order of the White Lotus. The Order liberates Ba Sing Se. Sokka, Toph, and the warrior Suki attack the Fire Nation's airships, while Zuko and Katara confront Azula to prevent her from being crowned as the new Fire Lord. As the comet arrives, Aang confronts Ozai but cannot get the upper hand until Ozai triggers Aang's connection to the Avatar State. Aang strips Ozai of his firebending powers. Zuko is crowned the new Fire Lord and arranges an armistice, establishing peace in the world. The series consists of sixty-one episodes. The first episode—an-hour-long premiere—aired on February 21, 2005, on Nickelodeon. The series concluded with a two-hour television movie broadcast on July 19, 2008. Each season of the series is known as a "book", in which each episode is referred to as a "chapter". Each book takes its name from one of the elements Aang must master: Water, Earth, and Fire. The show's first two seasons each consists of twenty episodes and the third season has twenty-one. The entire series has been released on DVD in regions 1, 2 and 4. Avatar: The Last Airbender was co-created and produced by Michael Dante DiMartino and Bryan Konietzko at Nickelodeon Animation Studios in Burbank, California. Its animation was mostly done by South Korean studios JM Animation, DR Movie, and MOI Animation. According to Konietzko, the series was conceived in early 2001 when he took an old sketch of a balding, middle-aged man and imagined the man as a child. He drew the character herding bison in the sky and showed the sketch to DiMartino, who was watching a documentary about explorers trapped at the South Pole. Konietzko described their early development of the concept; "There's an air guy along with these water people trapped in a snowy wasteland ... and maybe some fire people are pressing down on them". The co-creators successfully pitched the idea to Nickelodeon vice-president and executive producer Eric Coleman two weeks later. The series was introduced to the public in a teaser reel at Comic-Con 2004, and premiered on February 21, 2005. In an interview, Konietzko said: "Mike and I were really interested in other epic 'Legends & Lore' properties, like Harry Potter and Lord of the Rings, but we knew that we wanted to take a different approach to that type of genre. Our love for Japanese anime, Hong Kong action and kung fu cinema, yoga, and Eastern philosophies led us to the initial inspiration for Avatar: The Last Airbender." Fictional locations featured in the show are based on the architecture and designs of real locations. For example, the creators modeled the city of Ba Sing Se off the Forbidden City in China. The series is notable for borrowing extensively from East Asian art and mythology for its universe. Its creators employed cultural consultants Edwin Zane and calligrapher Siu-Leung Lee to help determine its art direction and settings. Its character designs are influenced by Chinese art and history, Hinduism, Taoism and Buddhism, and Yoga. Jeremy Zuckerman and Benjamin Wynn composed the series' music and sound; they experimented with a wide range of instruments, including the guzheng, pipa, and duduk, to match the show's Asia-influenced setting. The art style of the fictitious locations used in the series are based on real locations in Asia. Sites such as the Forbidden City and the Great Wall of China in Beijing were inspirations for the Earth Kingdom city of Ba Sing Se, and Water Tribe locations were based on Inuit and Sireniki cultures. According to writer Aaron Ehasz, early Fire Nation designs were based on Japanese culture. To avoid accidentally making broad statements, they redesigned many settings and peoples to be more "broadly inspired". For the final design, the creators went with a more Chinese style for the Fire Nation's clothing and architecture. For instance, the Fire Temple was based on the Yellow Crane Tower, as its flame-like architectural elements were a perfect motif for the Fire Nation architecture according to the creators. The fighting styles employed by the show's characters are derived from Chinese martial arts, for which the film-makers employed Sifu Kisu of the Harmonious Fist Chinese Athletic Association as a consultant. Each fighting style is unique to the "benders" who use them or characters who are aligned to a certain element. For example, practitioners of "waterbending" use movements influenced by T'ai chi and focused on alignment, body structure, breath, and visualization. Hung Gar was the inspiration for practitioners of "earthbending", and was chosen for its firmly rooted stances and powerful strikes as a representation of the solidity of earth. Northern Shaolin, which uses strong arm and leg movements, was chosen to represent "firebending". Ba Gua, which uses dynamic circular movements and quick directional changes, was used for "airbending". The Chu Gar Southern Praying Mantis style can be seen practiced by the earthbender Toph, who develops a unique fighting style as a result of her blindness. Asian cinema influenced the presentation of these martial-art bending moves. The series explored many concepts rarely touched on in western children's television shows, including issues relating to war, genocide, and imperialism, gender discrimination and female empowerment, marginalization and oppression, and the philosophical questions surrounding fate and destiny. The show is set during a period where the entire world is engulfed in an imperialistic war initiated by the Fire Nation. While war is a constant backdrop, the show depicts these effects through the eyes of common people—the oppressed Earth Kingdom citizens as well as brainwashed Fire Nation schoolchildren—to show how war makes victims of everyone. And while the Fire Nation is presented as the instigator of violence, the show also depicts the systemic inequality experienced by residents in the Earth Kingdom city of Ba Sing Se as well as the nefarious activities of the city's secret police. These situations show the corrupting nature of power and the nuances of good and evil. The show introduces viewers to genocide early on when protagonist Aang visits his former home in the Southern Air Temple. He arrives to discover his people have been massacred, and allows him to display a range of emotions, from rage to loss. The character Zuko and his relationship with his father and Uncle Iroh is the series' main redemption arc and represents the show's message that destiny and fate are not binding or set by other people, but can be changed. In season one, he struggles to conform to the destiny and path determined by his father, but Iroh prods him, asking, "who are you, what do you want?" The show also represents a diverse cast of characters in order to tackle the issue of marginalization. For example, in introducing a blind character like Toph and a paraplegic boy like Teo, the show depicted characters with vulnerabilities overcoming their physical and societal limitations. This is also true when it comes to the show's female characters. For example, female protagonist Katara faces systemic sexism when she reaches the Northern Water Tribe to learn waterbending. In another instance, her brother, Sokka is initially dismissive of the all-female Kyoshi Warriors, but learns to respect and appreciate their skills. According to Kirk Hamilton of Kotaku, these themes represent the show's message that it's more important to be yourself than to hew to the roles society expects of you." Several books based on the show have been published. Dark Horse Comics published an art book titled Avatar: The Last Airbender – The Art of the Animated Series on June 2, 2010, with 184 pages of original art from the series. Several comic-book short stories were published in Nickelodeon Magazine, and Dark Horse published Avatar: The Last Airbender – The Lost Adventures—a collection of these and new comics—on June 15, 2011. Dark Horse published a graphic-novel series by Gene Yang that continues Aang's story after the Hundred Years' War. Avatar: The Last Airbender – The Promise, published in three volumes in 2012, explores the fate of the Fire Nation colonies that become The Legend of Korra's United Republic. A second set of three comic books, Avatar: The Last Airbender – The Search, focuses on Zuko and Azula, and the fate of their mother Ursa. The third set, Avatar: The Last Airbender – The Rift, shifts the focus to Aang, the creation of Republic City, and Toph's relationship with her family. The Rift was followed by Avatar: The Last Airbender – Smoke and Shadow about a resistance force in the Fire Nation against Fire Lord Zuko, who at the end of the original series assumed the throne. The fifth graphic novel was Avatar: The Last Airbender – North and South, which follows the events of Smoke and Shadow and is about Katara and Sokka returning to the Water Tribe to see various changes to their homeland. The next planned graphic novel is titled Imbalance and is planned to be released in October 2018. The series explores the emerging conflict between the benders and non-benders that becomes the center for the conflict in the first season of the sequel the Legend of Korra. Unlike the previous five books it is will not be written by Gene Yang. A two-part young adult novel series focusing on Avatar Kyoshi will be written by F. C. Yee and published by Abrams Children's Books. The first book, The Rise of Kyoshi, is scheduled to be published in July 2019. A video-game trilogy based on the series has been released. The Avatar: The Last Airbender video game was released on October 10, 2006, and Avatar: The Last Airbender – The Burning Earth was released on October 16, 2007. Avatar: The Last Airbender – Into the Inferno was released on October 13, 2008. Avatar: Legends of the Arena, a massively multiplayer online role-playing game (MMORPG) for Microsoft Windows, was released on September 15, 2008, by Nickelodeon. Players can create their own character and interact with other players around the world. Avatar: The Last Airbender was THQ's bestselling Nickelodeon game in 2006 and was one of Sony CEA's Greatest Hits. The series' first season was the basis of the 2010 live-action film The Last Airbender, which was written and directed by M. Night Shyamalan. It was intended as the first of a trilogy of films, each of which would be based upon one of the three television seasons. The film was universally panned for its writing, acting, whitewashed cast, and Shyamalan's direction; it earned a 6% approval rating on Rotten Tomatoes as well as five Razzies at the 31st Golden Raspberry Awards, including Worst Picture. Although the film originally shared the title of the television series, the title The Last Airbender was used because producers feared it would be confused with James Cameron's film Avatar. The Last Airbender stars Noah Ringer as Aang, Nicola Peltz as Katara, Jackson Rathbone as Sokka, Dev Patel as Zuko, and Shaun Toub as Iroh. The Legend of Korra, a sequel series to Avatar: The Last Airbender, premiered on Nickelodeon on April 14, 2012. It was written and produced by Michael Dante DiMartino and Bryan Konietzko, the creators and producers of the original series. The show was initially titled Avatar: Legend of Korra, then The Last Airbender: Legend of Korra; its events occur seventy years after the end of Avatar: The Last Airbender. The series' protagonist is Korra, a 17-year-old woman from the Southern Water Tribe who is the incarnation of the Avatar after Aang's death. Netflix announced in September 2018 that a "reimagined" live-action remake of Avatar was to start production in 2019. The series' original creators, DiMartino and Konietzko, are to be the executive producers and showrunners. They said that they intended to adapt the series "with a culturally appropriate, non-whitewashed cast". Jeremy Zuckerman, who composed music for the original show, will also be returning to do the music for the remake. The release is slated for 2020. Avatar: The Last Airbender was the highest-rated animated television series in its demographic at its premiere; an average of 3.1 million viewers watched each new episode. It had 5.6 million viewers for its highest-rated episode and was a highly rated part of the Nicktoons lineup beyond its 6-to-11-year-old target demographic. A one-hour special, The Secret of the Fire Nation, consisting of the episodes "The Serpent's Pass" and "The Drill", aired on September 15, 2006, and attracted 5.1 million viewers. According to the Nielsen Media Research, the special was the highest-rated cable-television program that week. In 2007, Avatar: The Last Airbender was syndicated to more than 105 countries and was one of Nickelodeon's top-rated programs. The series ranked first on Nickelodeon in Germany, Indonesia, Malaysia, the Netherlands, Belgium, and Colombia. The four-part series finale, "Sozin's Comet", had the series' highest ratings. Its first airing averaged 5.6 million viewers, 95 percent more than Nickelodeon had in mid-July 2007. During the week of July 14, it was the most-viewed program by the under-14 demographic. The finale's popularity was reflected in online media; Rise of the Phoenix King, a Nick.com online game based on "Sozin's Comet", had almost 815,000 game plays in three days. IGN ranked the series 35th on its list of top 100 animated TV shows. Avatar: The Last Airbender received critical acclaim. Max Nicholson of IGN called it a "must-watch" and described it as "one of the greatest animated series of all time". Nick Hartel of DVD Talk called the series a remarkable, "child friendly show" whose legacy "should endure for years to come". Erik Amaya of Bleeding Cool described the series as "impressive in its sophistication" and "fantastic". Henry Glasheen of SLUG Magazine called the series "adventurous and exciting", a "classic" and occasionally moving. According to Brittany Lovely of Hypable, it tells "complex and beautiful" stories. Joe Corey of Inside Pulse described the series as an anime-action hybrid. Chris Mitchell of Popzara called it one of best shows to air on Nickelodeon, praising the series' background music and voice acting. D. F. Smith of IGN recommended it to viewers who enjoy action-adventure cartoons. Rob Keyes of Screen Rant called the series "one of the greatest cartoons ever made". Mike Noyes of Inside Pulse recommended it to viewers who enjoy "great" adventure. Gord Lacey of TVShowsonDVD.com called the series "one of the finest animated shows ever". According to Todd Douglass, Jr. of DVD Talk, adults will enjoy the series as much as children do. Joshua Miller of CHUD.com called it "phenomenal" and "one of the most well animated programs (children's or adult) American TV has ever had"; according to Miller, the series is heavily influenced by anime. Tim Janson of Cinefantastique described it as "one of the most engaging animated shows produced". Dennis Amith of J!ENT called the series "one of the best animated TV series shown in the US by American creators". Amith praised its sophisticated storylines, edginess, humor, and action. Franco "Cricket" Te of Nerd Society described Avatar: The Last Airbender as "one of the best cartoon[s]" he had ever seen, recommending the series for its characters and plot. Scott Thill of Wired called the series engaging and its setting, influenced by the Eastern world, "fantastic". Kirk Hamilton of Kotaku said the series should be part of the golden age of television, and recommended "the sophisticated kids show" to others. The show's writing and theme have been widely praised by critics. Michael S. Mammano of Den of Geek called the plot "smartly-written" and praised the animation. Nicole Clark, writing for Vice News, wrote that the show's narrative depth was "its greatest asset", and praised the story's "emotional authenticity" and how it "expose[d] very young viewers to darker subject matter, like genocide and authoritarianism, while giving them a framework for understanding these issues." Jenifer Rosenberg of ComicMix liked the program's emphasis on family, friends, community, and education. According to Nick Hartel, the series touches on themes of "genocide and self-doubt" without frightening younger children; rogue characters are redeemable, sending an important message that people can change and are not bonded to "destiny". Chris Mitchell called the plot "fantastic". D. F. Smith compared the series' plot to Japanese action cartoons, calling its tone and dialogue "very American" and praising the humor leavening an epic, dramatic theme suitable for all ages. Rob Keyes also praised the series' humor and affecting plot: "[It] will capture your hearts". According to Mike Noyes, the series amalgamates elements of "classic fantasy epics". Todd Douglass, Jr. called the plot engaging, well-thought-out, and meaningful. The series' concept is "well-realized", with a consistent story. Douglass wrote that the characters "[have] a real sense of progression", and praised the writers for their humor, drama, and emotion. Joshua Miller called the series surprisingly dark despite its "silly" theme; the plot is livelier than that of Lost and, similar to the latter show, emphasizes character development. According to Miller, its writing was "true adult levels of storytelling". Tim Janson described the series as more than fantasy-and superhero-themed, seeing the characters as central and relateable. "Cricket" Te praised the series' use of Buddhist philosophies and the diverse presentation of its themes of courage and life. Kirk Hamiltion praises the series for expressing towards its audience to be themselves and for its quiet progressivism. Critics also praised Avatar: The Last Airbender's character development, art, animation, and choreography; Eric Amaya enjoyed the expressive animation that complements the writing. According to Amaya, the elements were influenced by Hayao Miyazaki. Todd Douglass, Jr. called the character development interesting, while Nicole Clark wrote that the show "managed to do what so few shows even today have: assemble a cast of characters that depicts the world as it is, with a range of identities and experiences." Jenifer Rosenburg praised the series' portrayal of females as "strong, responsible, [and] intelligent". According to Joshua Miller, the bender characters' use of bending for everyday activities brings "depth and believability" to the avatar world. Miller called the series' designs "rich and immersive", with each nation having its own, detailed look. He praised the action scenes as "well rendered", comparing the development of the avatar world to that of The Lord of the Rings, and the fight choreography as "wonderful in its most minor details". D. F. Smith enjoyed the series' painstaking backgrounds. "Cricket" Te praised each episode's color palette and the choreography's combination of martial arts and magic. Nick Hartel criticized the animation, although he found it an improvement over previous Nickelodeon shows. Chris Mitchell called the animation fluid. "Cricket" Te agreed, noting its manga influence. According to Brittany Lovely, non-bender characters in battle are "overshadowed" by their bender counterparts. Joe Corey called the animation's action and environments a "great achievement", and Rob Keyes praised the series' fight choreography. According to Kirk Hamilton, the action sequences in the series are amazing while being child-appropriate and exciting. ^ "Japanese animation creates a stir". Jamaica Gleaner. August 25, 2012. Archived from the original on October 31, 2016. ^ Futter, Mike (October 17, 2014). "The Legend of Korra: Get a Look at the Animation and Combat of The Legend Of Korra". Game Informer. Archived from the original on November 4, 2014. ^ a b "Avatar: The Last Airbender creators return for live-action Netflix remake". Polygon. Retrieved September 18, 2018. ^ a b "The Boy in the Iceberg". Avatar: The Last Airbender. IGN. February 21, 2005. Archived from the original on July 24, 2013. Retrieved July 21, 2008. ^ "Sozin's Comet". Avatar: The Last Airbender. TV Guide. Archived from the original on August 25, 2013. Retrieved July 21, 2008. ^ "Avatar: The Last Airbender on DVD". TVShowsOnDVD.com. February 24, 2005. Archived from the original on October 17, 2008. Retrieved October 28, 2008. ^ a b DiMartino, Michael Dante; Konietzko, Bryan (2006). "In Their Elements". Nickelodeon Magazine (Winter 2006): 6. ^ Clark, Craig J. (October 17, 2007). "It's Elementary – Avatar: The Last Airbender". Animation World Magazine, Inc. Archived from the original on January 20, 2008. ^ Baisley, Sarah (September 9, 2004). "Comic-Con International 2004 Report". Animation World Network. Archived from the original on March 3, 2016. ^ Baisley, Sarah (February 18, 2005). "Nick Premieres Avatar in Hour Special Feb. 21". Animation World Network. Archived from the original on October 27, 2017. ^ "IGN: Interview: Avatar's Bryan Konietzko and Michael Dante DiMartino". IGN. September 6, 2007. Archived from the original on November 18, 2007. ^ a b Mark Lasswell (August 25, 2005). "Kung Fu Fightin' Anime Stars, Bo". New York Times. Archived from the original on March 27, 2008. ^ "Edwin Zane — Filmography". New York Times. Archived from the original on February 21, 2009. ^ "Interview With The Creators". NickSplat.com. October 12, 2005. Archived from the original on December 17, 2007. ^ "Interview with The Track Team". SoundtrackNet. Archived from the original on November 5, 2012. Retrieved August 20, 2009. ^ Konietzko, Michael and Michael DiMartino (2010). Avatar: The Last Airbender—The Art of the Animated Series. Dark Horse Comics. pp. 130–172. ISBN 9781595825049. ^ a b c d e f g h i j Clark, Nicole (July 20, 2018). "'Avatar: The Last Airbender' Is Still One of the Greatest Shows of All Time". Vice News. Retrieved July 28, 2018. ^ Konietzko, Bryan; DiMartino, Michael Dante (2010). Avatar, The Last Airbender: The Art of the Animated Series. Dark Horse. p. 25. ISBN 978-1-62115-798-4. ^ Konietzko, Bryan; DiMartino, Michael Dante (2010). Avatar, The Last Airbender: The Art of the Animated Series. Dark Horse. p. 52. ISBN 978-1-62115-798-4. ^ "The National Shaolin Information Resource". The Harmonious Fist Chinese Athletic Association. Archived from the original on December 5, 2006. ^ Sifu Kisu. Creating the Legend. Nickelodeon. ^ "Audience Questions and Answer Part 2 at the San Diego Comi-con 2006" (WMV). Flaming June. Archived from the original on April 14, 2008. Retrieved May 7, 2008. ^ Childs, Hayden (June 7, 2011). "Avatar: The Last Airbender: "The Southern Air Temple"/"The Warriors Of Kyoshi"". The A.V. Club. Retrieved July 28, 2018. ^ a b c d Hartel, Nick (November 23, 2015). "Avatar: The Last Airbender (The Complete Series)". DVD Talk. Archived from the original on November 13, 2008. ^ a b c d e Hamilton, Kirk (February 28, 2017). "Avatar: The Last Airbender Is One Of The Greatest TV Shows Of All Time". Kotaku. Archived from the original on July 31, 2017. ^ "Avatar: The Last Airbender — The Art of the Animated Series :: Profile :: Dark Horse Comics". Dark Horse Comics. Archived from the original on November 5, 2012. ^ "Avatar: The Last Airbender — The Lost Adventures :: Profile :: Dark Horse Comics". Dark Horse Comics. Archived from the original on November 5, 2012. ^ Sunu, Steve (June 25, 2012). "EXCLUSIVE: Yang Continues "Avatar: The Last Airbender" in "The Search"". Comic Book Resources. Archived from the original on June 27, 2012. ^ Phegley, Kiel (July 24, 2013). "SDCC EXCLUSIVE: Yang Takes "Avatar: The Last Airbender" To "The Rift"". Comic Book Resources. Comic Book Resources. Archived from the original on December 13, 2014. Retrieved July 29, 2014. ^ "Avatar: The Last Airbender — Smoke and Shadow (Part Three)". Dark Horse Comics. Retrieved January 26, 2017. ^ Gerding, Stephen. "New "Avatar: The Last Airbender" Graphic Novel Series Debuts in 2016". Comic Book Resources. Retrieved February 19, 2016. ^ "Dark Horse announces new 'Avatar: The Last Airbender' comics". EW.com. Retrieved June 2, 2018. ^ Canfield, David (August 29, 2018). "Avatar: The Last Airbender universe to expand with new novels". Entertainment Weekly. Retrieved September 6, 2018. ^ "Avatar: The Last Airbender". GameSpot. Archived from the original on December 17, 2007. ^ "Avatar: The Last Airbender - The Burning Earth". GameSpot. Archived from the original on October 16, 2017. ^ "Avatar: The Last Airbender - Into the Inferno". GameSpot. Archived from the original on January 8, 2007. ^ "Nickelodeon Launching Avatar MMORPG Worldwide In September". Worlds in Motion. Archived from the original on September 8, 2008. ^ Jose Liz (July 19, 2007). "THQ's Avatar Now Available for $20". Archived from the original on August 27, 2007. ^ a b Mahajan, Mradula (September 30, 2015). "'Avatar: The Last Airbender' Sequel Update: Trilogy In Making; M. Night Shyamalan To Not Repeat Mistakes of Failed Adaptation!". Archived from the original on October 5, 2015. ^ "The Last Airbender". Rotten Tomatoes. Archived from the original on August 30, 2017. ^ "Razzie Awards: 'The Last Airbender' earns Worst Picture, Director, and 'Eye-Gouging Misuse of 3-D'". Entertainment Weekly. February 26, 2011. Archived from the original on March 2, 2017. ^ Stephenson, Hunter (April 15, 2008). "M. Night Shyamalan's The Last Airbender Gets Release Date, Director Update, "Avatar" Dropped From Title". /Film. Archived from the original on September 1, 2017. ^ a b "Nick Press The Legend of Korra press release". Nick Press. March 15, 2012. Archived from the original (PDF) on September 28, 2013. ^ Liu, Ed (April 19, 2010). "Nickelodeon Studios Staffing Up for New "Avatar the Last Airbender" Project". Toon Zone LLC. Archived from the original on April 19, 2014. ^ "Animation News Discussion Cartoon Community – toonzone news". Toonzone.net. Archived from the original on August 5, 2010. ^ Otterson, Joe (September 18, 2018). "'Avatar: The Last Airbender' Live-Action Series Set at Netflix". Variety. Retrieved September 18, 2018. ^ Jacobs, Mira (September 21, 2018). "Netflix's Avatar: The Last Airbender Adds Another Name From Animated Series". CBR. Retrieved September 22, 2018. ^ "Avatar The Last Airbender". Netflix. Retrieved September 28, 2018. ^ a b Bynum, Aaron H. (June 30, 2006). "Avatar: Season 3". Animation Insider. Archived from the original on February 7, 2007. ^ Kit, Borys (January 9, 2007). "Element of Shyamalan in "Airbender"". The Hollywood Reporter. Nielsen Business Media, Inc. Archived from the original on January 11, 2007. ^ "In Brief: Avatar's Big Finish". TV Guide: 12. December 18–24, 2006. ^ Bynum, Aaron H. (September 20, 2006). "Secret of the Fire Nation Ratings". Animation Insider. Archived from the original on February 7, 2012. ^ "Aang Is Ready to Strike Down the Fire Nation on the Darkest Day of the Year in Avatar's "Day of Black Sun" Premiering Friday, Nov. 30 on Nickelodeon". Viacom. November 14, 2007. Archived from the original on November 15, 2007. ^ Gray, Alan (July 22, 2008). "Nickelodeon's Avatar: The Last Airbender Hits All-Time Series High". News Blaze. Archived from the original on February 28, 2017. ^ Diaz, Glenn L. "19 Million Tuned in for Special "Avatar" Week". Buddytv.com. Archived from the original on December 7, 2008. ^ Luna, Kyle. "Nick's "AVATAR" Animation Series Finale Scores Big Ratings". Animationinsider.net. Archived from the original on January 5, 2009. ^ Ball, Ryan (July 23, 2008). "Nick's Avatar Hits Ratings High". Animation Magazine. Archived from the original on July 28, 2008. ^ "IGN – 35: Avatar: The Last Airbender". Tv.ign.com. Archived from the original on July 24, 2013. ^ Nicholson, Max (October 5, 2015). "Avatar: The Last Airbender - The Complete Series DVD Review". IGN. Archived from the original on July 9, 2017. ^ a b Amaya, Erik (October 6, 2015). "Avatar: The Last Airbender The Complete Series Continues To Impress - A Review - Bleeding Cool News And Rumors". Bleeding Cool. Archived from the original on January 28, 2016. ^ Glasheen, Henry (October 31, 2015). "Review: Avatar: The Last Airbender – The Complete Series – SLUG Magazine". SLUG Magazine. Archived from the original on June 28, 2015. ^ a b Lovely, Brittany (September 20, 2015). "Avatar and Legend of Korra non-benders deserve appreciation". Hypable. Archived from the original on December 2, 2008. ^ a b Corey, Joe (October 12, 2015). "DVD Review: Avatar: The Last Airbender (The Complete Series) | Inside Pulse". Inside Pulse. Archived from the original on August 9, 2017. ^ a b c Mitchell, Chris (October 7, 2015). "Avatar: The Last Airbender: The Complete Series (DVD) | Popzara Press - The Latest Bits and Bytes!". Popzara Press. Archived from the original on March 15, 2012. ^ a b c Smith, D. F. (June 17, 2010). "Avatar: The Last Airbender - The Complete Book 1 DVD Review". IGN. Archived from the original on November 5, 2012. ^ a b c Keyes, Rob (June 27, 2010). "Avatar: The Last Airbender Book 1 Collector's Edition Review". Screen Rant. Archived from the original on November 5, 2012. ^ a b Noyes, Mike (June 16, 2010). "Avatar: The Last Airbender: The Complete Book 1, Collector's Edition – DVD Review | Inside Pulse". Inside Pulse. Archived from the original on November 5, 2012. ^ Lacey, Gord (July 9, 2010). "Avatar: The Last Airbender - The Complete Book 1 (Collector's Edition) Review | TVShowsOnDVD.com". TVShowsOnDVD.com. Archived from the original on December 19, 2012. ^ a b c Douglass Jr., Todd (June 22, 2010). "Avatar The Last Airbender: The Complete Book 1". DVD Talk. Archived from the original on September 28, 2015. ^ a b c Miller, Joshua (September 13, 2010). "DVD Review: Avatar: The Last Airbender - The Complete Book 1 (Collector's Edition)". CHUD.com. Archived from the original on February 14, 2010. ^ a b Janson, Tim (July 9, 2010). "Avatar: the Last Airbender Book 1 Collector's Edition DVD Review". cinefantastiqueonline.com. Archived from the original on September 28, 2015. ^ Amith, Dennis (June 9, 2010). "Avatar: the Last Airbender: The Complete Book 1 – Collector's Edition (a J!-ENT DVD Review)". j-entonline.com. Archived from the original on September 15, 2008. ^ a b c d Te, Franco (June 22, 2010). "DVD Review: Avatar: The Last Airbender - The Complete Book 1 (Collector's Edition)". Nerd Society. Archived from the original on January 26, 2008. ^ Thill, Scott (June 22, 2010). "Bend Our Minds, Win Avatar: The Last Airbender DVD Box". Wired. Archived from the original on September 28, 2017. ^ Mammano, Michael (August 24, 2015). "Avatar: The Last Airbender - The Complete Series Coming". Den of Geek. Archived from the original on August 27, 2007. ^ a b Rosenburg, Jenifer (June 20, 2010). "Review: 'Avatar: The Last Airbender: The Complete Book 1 Collector's Edition' | ComicMix". ComicMix. Archived from the original on March 12, 2016. ^ a b Ball, Ryan (May 3, 2005). "Cartoons on the Bay Picks Winners". Animation Insider. Archived from the original on December 11, 2007. ^ a b c "Annie Awards: Legacy – 33rd Annual Annie Awards". International Animated Film Society. February 9, 2005. Archived from the original on May 17, 2008. ^ "Kids' Choice Awards '07 Nominees". who.com. August 1, 2007. Archived from the original on August 22, 2007. ^ a b "Annie Awards: Legacy – 34th Annual Annie Awards". International Animated Film Society. February 9, 2006. Archived from the original on May 9, 2008. ^ DeMott, Rick. "Simpsons, Avatar & Happy Feet Big Winners in Genesis Awards". Animation World Network. Archived from the original on July 7, 2013. ^ "Nominees/Winners (Outstanding Short Animated Program)". Television Academy. Archived from the original on July 20, 2017. ^ Desowitz, Bill (August 21, 2007). "Juried Emmy Awards Announced for Individual Achievement in Animation". Animation World Network. Archived from the original on September 29, 2017. ^ "Nickelodeon Kids' Choice Awards 2008 Press Kit". Nick Press. February 7, 2008. Archived from the original on November 17, 2016. ^ "Annecy 2008 – Official Selection". Annecy 2008. March 14, 2009. Archived from the original on November 13, 2008. ^ 68th Annual Peabody Awards Archived November 20, 2014, at the Wayback Machine, May 2009. ^ "2008 Satellite Awards". IPA. Archived from the original on June 28, 2015. ^ a b "2008 Annie Awards: For Your Consideration". Annie Awards. Archived from the original on December 2, 2008. ^ "MPSE'S 2009 GOLDEN REEL AWARDS NOMINEES". Motion Picture Editors Guild. Archived from the original on March 5, 2016. ^ "2009 Nickelodeon Kids' Choice Awards Winners!". Take 40. November 13, 2009. Archived from the original on March 15, 2012. ^ "Nickelodeon Kids' Choice Awards Nominations - Australia 2010! - The Hot Hits Live from LA". TheHotHits. August 18, 2010. Archived from the original on September 20, 2011. Wikimedia Commons has media related to Avatar: The Last Airbender. This page was last edited on 1 April 2019, at 07:18 (UTC).